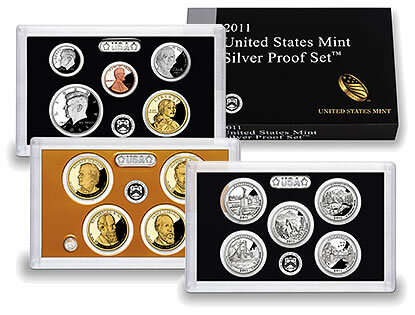 The 2011 United States Mint Silver Proof Set™ is one of two annual sets to be released by the US Mint during the year that contain 90% silver coins. The US Mint 2011 Silver Proof Set, shown above, includes 14 collector proof versions of the circulating coins of the year. 7 of them are composed of 90% silver. The US Mint first announced that it will be available on January 25, 2011 — more than a half year ahead of recent past launches. It was issued at 12:00 noon ET on the 25th for a price of $67.95. As expected, the price of the new set was higher than the previous year’s issue of $56.95. The price increase was driven mainly by rising costs of procuring silver. The 2011 Silver Proof Set includes a total of fourteen strikes representing the circulating coinage of the United States. All of the coins in the set are struck to proof quality at the US Mint’s facility in San Francisco. However, only seven of them are composed of 90% silver. The other seven are minted from special clad blanks. The seven within the Silver Proof Set featuring the 90% precious metal composition include the five America the Beautiful Quarters®, the Kennedy Half Dollar and the Roosevelt Dime. In total, these seven coins contain 1.338 ounces of silver. Packaging for the 2011 Silver Proof Set consists of three separate lenses encasing the coins. The lenses allow the holder to view both the obverse and reverse designs of the coin while protecting the strikes finish. The annual sets are always very popular with collectors. The 2010 set had sales figures of nearly 445,000 during its first three months of availability. While available, these sets (or subsequent year’s releases) may be purchased directly from the US Mint website at http://catalog.usmint.gov/ or via its toll free telephone number 1-800-USA-MINT (872-6468). There are no household order limits in place for the numismatic product. Of interest, sales of these sets were temporarily halted during the year as silver prices escalated. The sets were returned to availability as the price of silver retreated. Struck from 90% silver, the Gettysburg Quarter will feature an obverse design originally by John Flanagan of the first President of the United States, George Washington. The reverse design will be emblematic of Gettysburg National Military Park which is located in the state of Pennsylvania. Each Glacier Quarter will also feature a portrait of George Washington by John Flanagan on their "heads side," and be struck from 90% silver. Reverse imagery of the coin will showcase a portion of Glacier National Park located in the state of Montana. John Flanagan’s portrait of George Washington will be seen again on the obverse of the Olympic Quarter. On the reverse, an image emblematic of Olympic National Park, located in the state of Washington, will be featured. Like all of the other recent quarters, an image of George Washington by John Flanagan will be used on the "heads side" of the Vicksburg Quarter. The reverse design will be emblematic of Vicksburg National Military Park found in the state of Mississippi. George Washington, first President of the United States, will be shown on the obverse of the Chickasaw Quarter. Chickasaw National Recreation Area, located in the state of Oklahoma, is the site honored with the design shown on the reverse of the coin. The "heads side" of the Kennedy Half Dollar contains a portrait of former President of the United States John F. Kennedy, as designed by Gilroy Roberts. The reverse of the coin was designed by Frank Gasparro and shows an image of the Seal of the President of the United States. A portrait of former President of the United States Franklin D. Roosevelt is shown on the obverse of the Roosevelt Dime. It was designed by John R. Sinnock. The reverse of the dime shows an olive branch, torch and oak branch is also the work of John R. Sinnock. Former President of the United States Abraham Lincoln is shown on the "heads side" of the Lincoln Cent and was designed by Victor D. Brenner. It has been used on the obverse of the cent coin since 1909. The reverse shows a Union Shield and was designed by Lyndall Bass. A forward facing former President of the United States Thomas Jefferson is shown on the obverse of the Jefferson Nickel and was designed by Jamie Franki. The reverse shows Jefferson’s Monticello home and was designed by Felix Schlag. Glenna Goodacre designed the image of the Native American Shoshone woman Sacagawea that is shown on the obverse of the Native American $1 Coin. Sacagawea is remembered as accompanying and guiding the famous Lewis and Clark Expedition. The reverse of the 2011 strike will showcase an image commemorating the important contributions that Native Americans have made to the history of the United States. A portrait of former President of the United States Andrew Johnson will be showcased on the "heads side" of the Andrew Johnson Presidential $1 Coin. The reverse of all of the Presidential Coin series contains an image of the Statue of Liberty as designed by Don Everhart. Former President of the United States Ulysses S. Grant is featured on the obverse of the Ulysses S. Grant Presidential $1 Coin. An image of the Statue of Liberty by Don Everhart is shown on the reverse. The "heads side" of the Rutherford B. Hayes Presidential $1 Coin will feature a portrait of the honored individual. The reverse will contain the standard image of the Statue of Liberty that is found on the reverse of all of the Presidential $1 coins and was designed by Don Everhart. James A. Garfield, former President of the United States, is featured on the obverse of the James A. Garfield Presidential $1 Coin. The reverse showcases the Statue of Liberty and was designed by Don Everhart.